Can you believe it’s November 1st? Halloween has come and gone and I know we are all thinking about Christmas, our favorite time of year. But hold on just a minute! 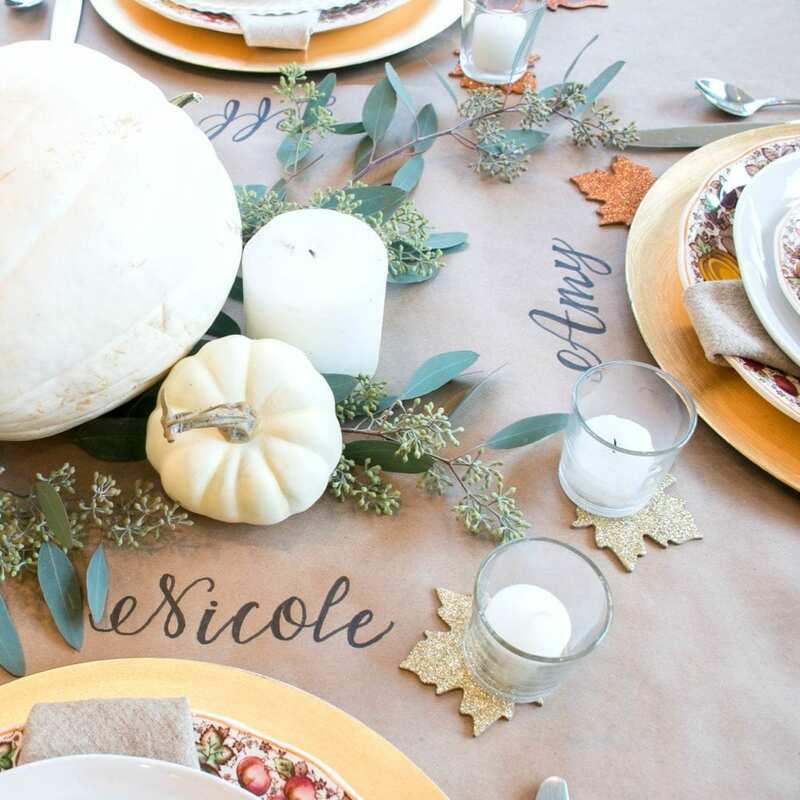 Thanksgiving is just around the corner and we still need to decide what we’re eating, who’s bringing what, and most importantly…..how we are going to decorate our table this year! 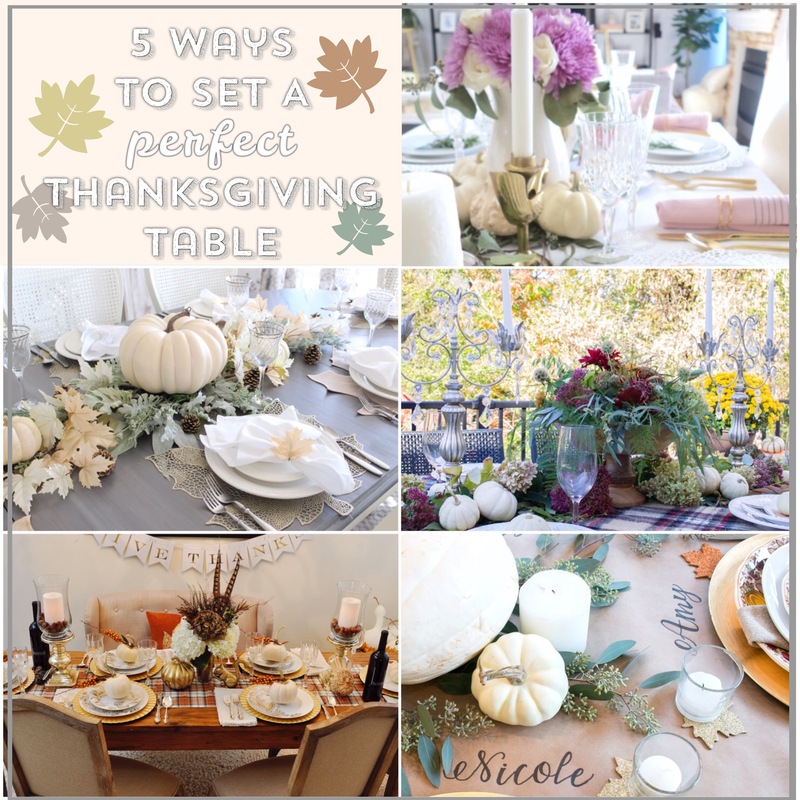 I’ve joined with 4 other lovely bloggers to bring you five ways to set a perfect Thanksgiving table. So whether you’re hosting indoors or outdoors, for 8 people or 38, we have some lovely ideas for you. 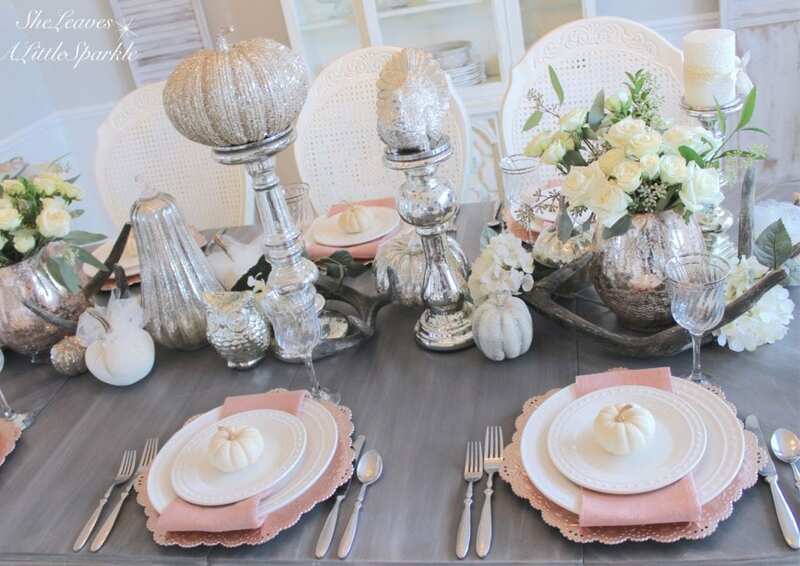 In one of my autumn home tours here, I shared this very elegant fall table with white roses, some sparkle, and hints of blush. 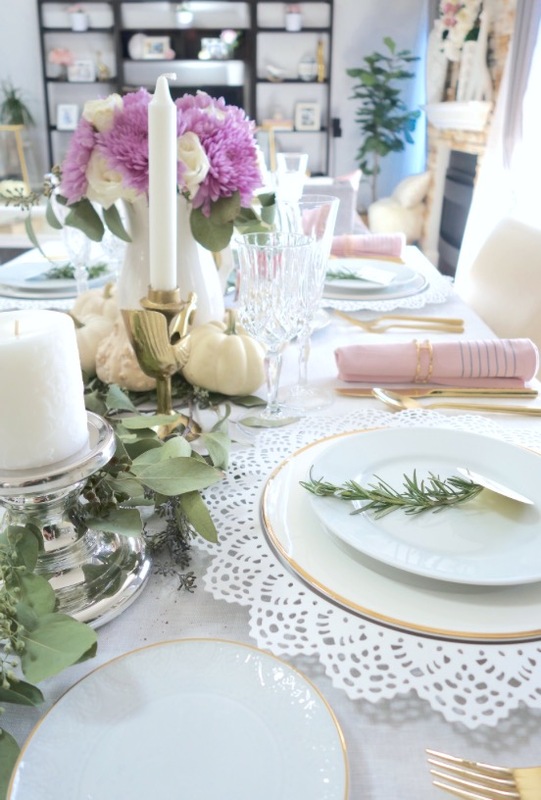 Today I decided to share with you a very simple and easy holiday table setting. I wanted to go with some natural elements. I was in Michaels Craft Store one day and saw these light, shimmery leaf stems. 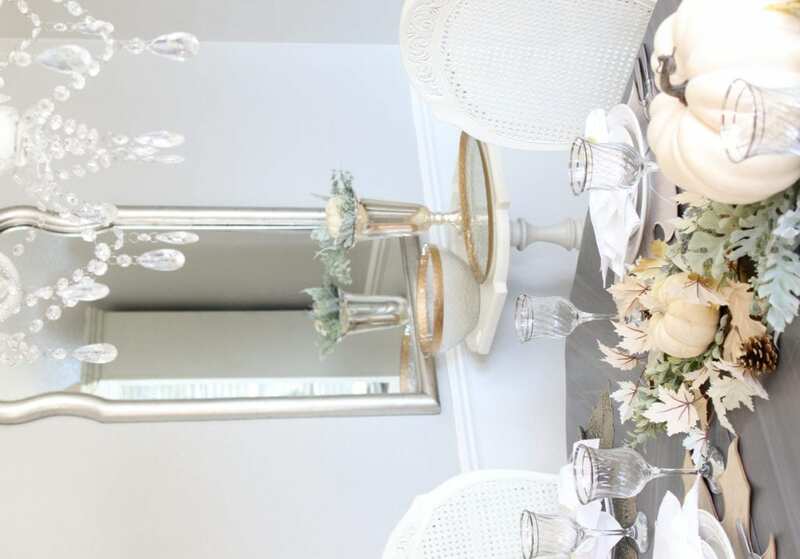 They were my inspiration for this more natural tablescape. I normally love lots of flowers and something sparkly but wanted to “challenge” myself to do something a little different. Maybe a little more relaxed or casual, yet still lovely and showing I made an effort. I grabbed some other green stems as well. 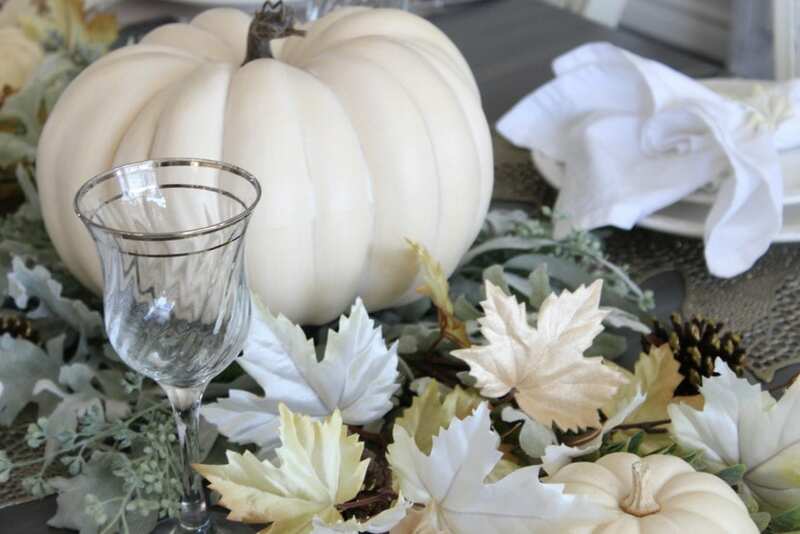 These were some of the same ones I used to create this lovely fall pumpkin centerpiece here in the champagne bucket. 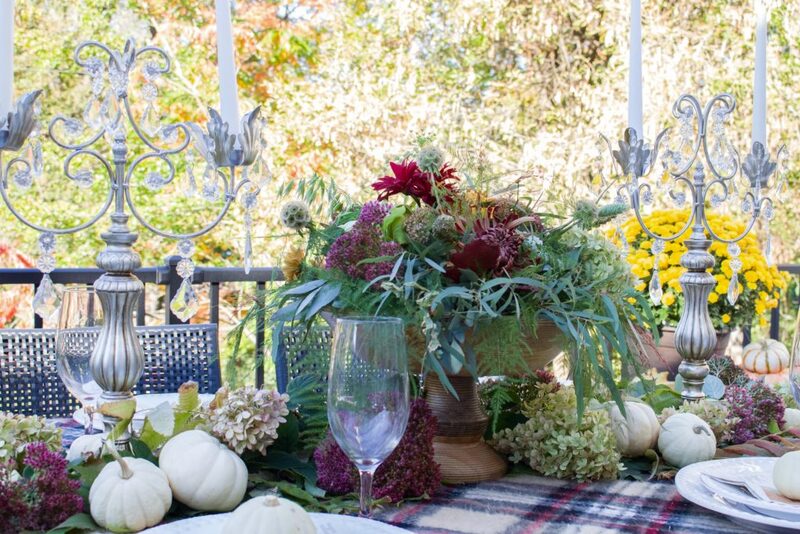 I used the same greenery and pumpkin from that and put it in the center of this tablescape, in the middle of the runner that I created from the new green and leaf stems. 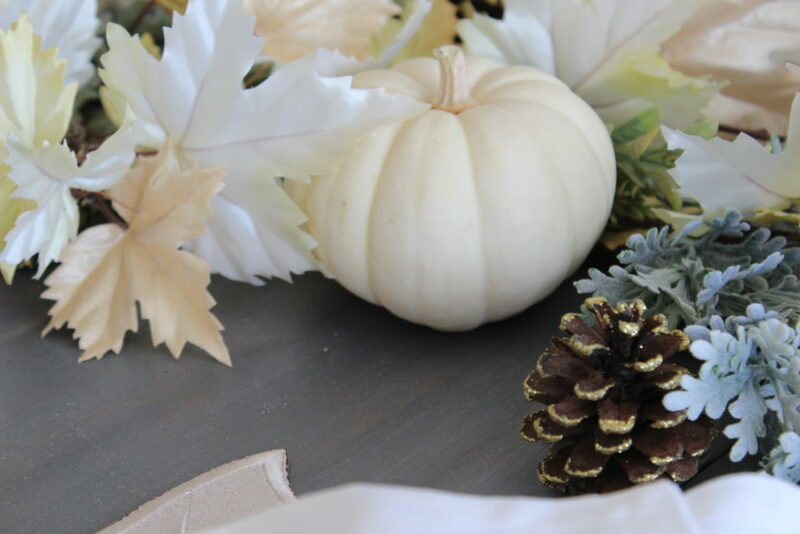 To continue with these natural elements, I just grabbed a couple of mini pumpkins I already had in my home and a handful of glittery pinecones and set them in the runner also. 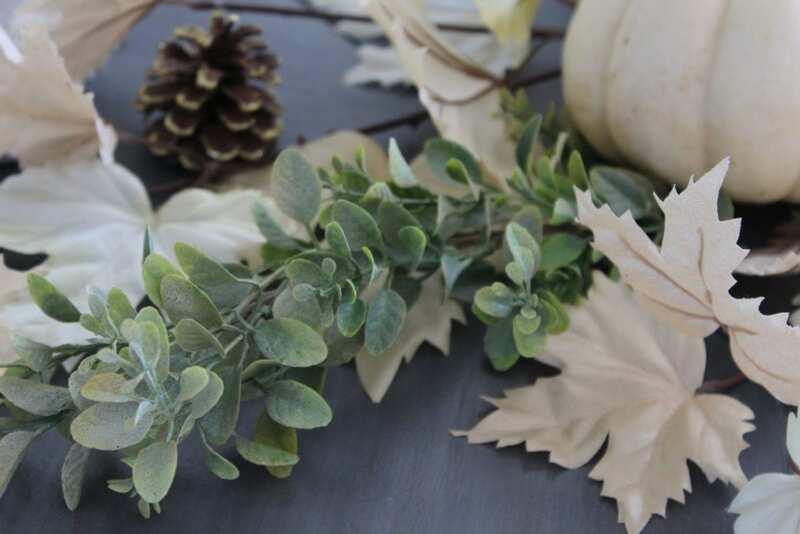 When I was at Home Goods one day, I found four of these adorable faux suede leaf placemats. Just four. Story of my life (sigh). Ha! So, naturally, I went to every Home Goods in Dallas and TJ Maxx and Marshalls. No luck. However, I found these plastic leaf female viagra colombia placemats in a 4-pack so I grabbed them. Um, I should mention….they were metallic orange. So I spray-painted them hammered pewter and then a layer of gold glitter spray paint over it lol! You know I love my spray paint and a girl’s gotta do what a girl’s gotta do! They turned out beautifully and I was able to alternate the placemats all the way around the table. 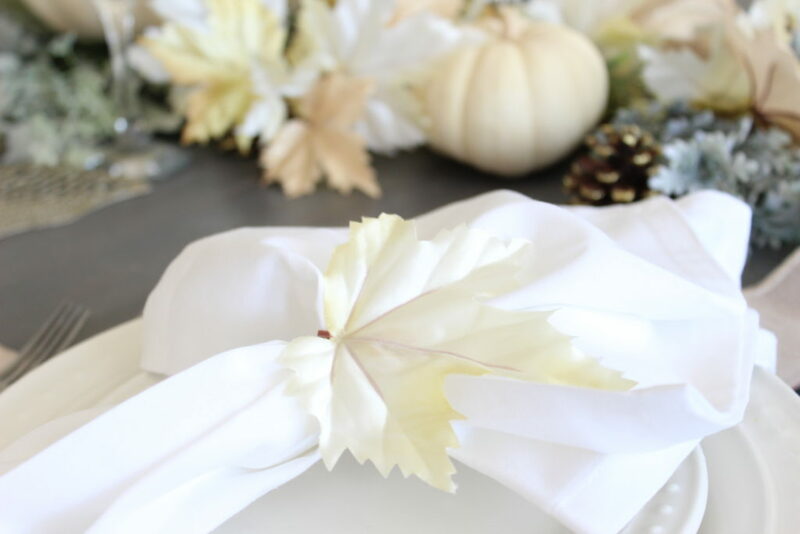 I found several darling leaf napkin ring sets BUT last minute I decided to take 8 leaves off the stems from my runner and create my own. All I had to do was pull off the leaf, hot glue 5 inches https://www.acheterviagrafr24.com/ou-acheter-du-viagra-a-paris/ of floral wire onto the back of the leaf (only 1 inch of wire goes on the back of the leaf) and then wrap the wire quickly with some light floral tape. All 8 took me less than a half hour. Then I just wrapped the wire around the napkin. Isn’t that fun?! Leaves are so pretty, aren’t they?! Even if they’re faux…..I love them! Adding my silverware and goblets that my mother gave to me when I got married, my table is complete. I love my new gold-rimmed bowl and platter in the background. I know just the salad and rolls that I’ll be making to go in those. 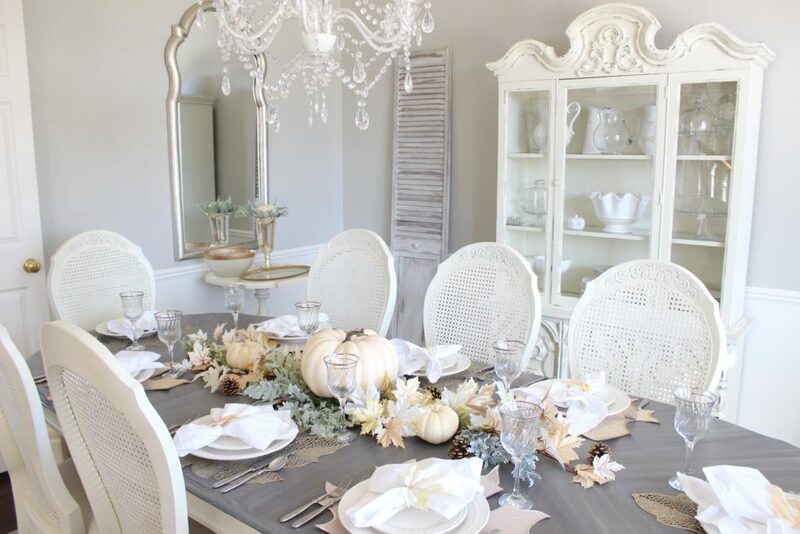 I’m hosting Thanksgiving here this year and I’d like to say that this will be my tablescape BUT….I still have 25 days and, if you know me, I will probably change my mind several times before then. 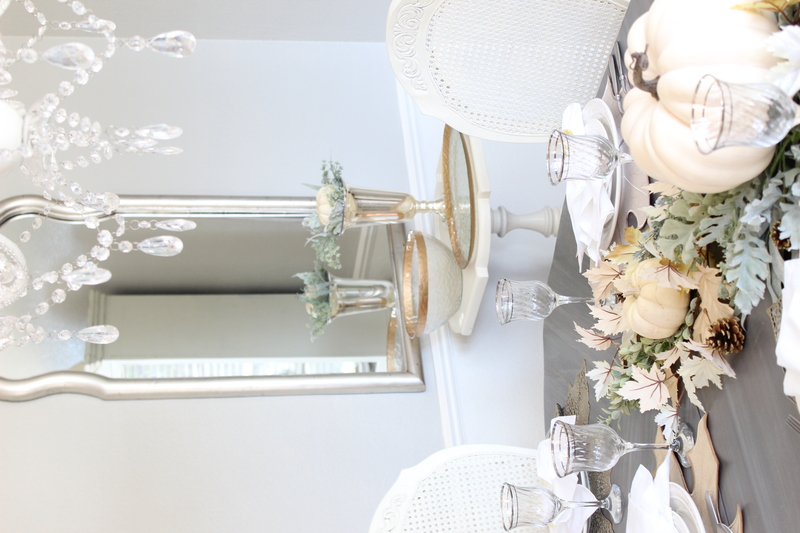 In fact, I have another tablescape (or two haha) I want to share with you shortly so stay tuned. I love this table though. 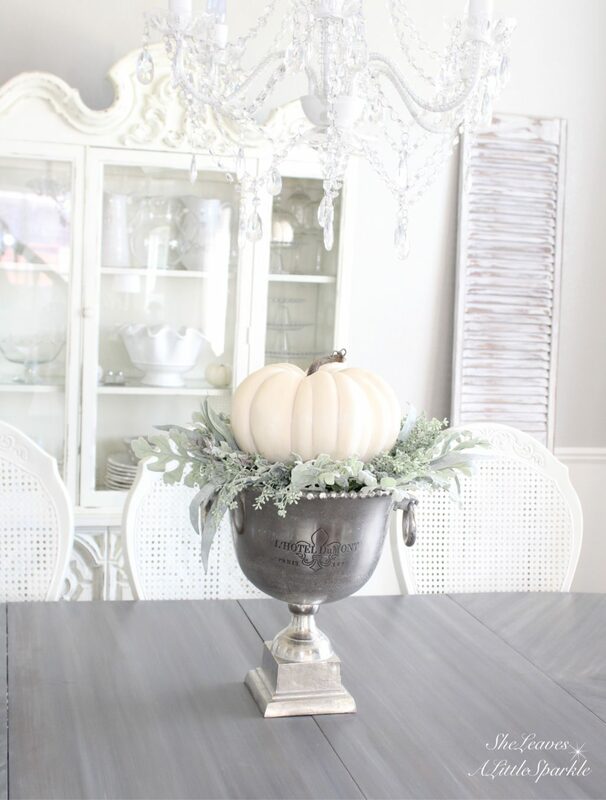 I love these natural elements and the comfortable feel of fall that it brings. I’ve rounded up the items I’ve used, or similar items, below for your shopping convenience. 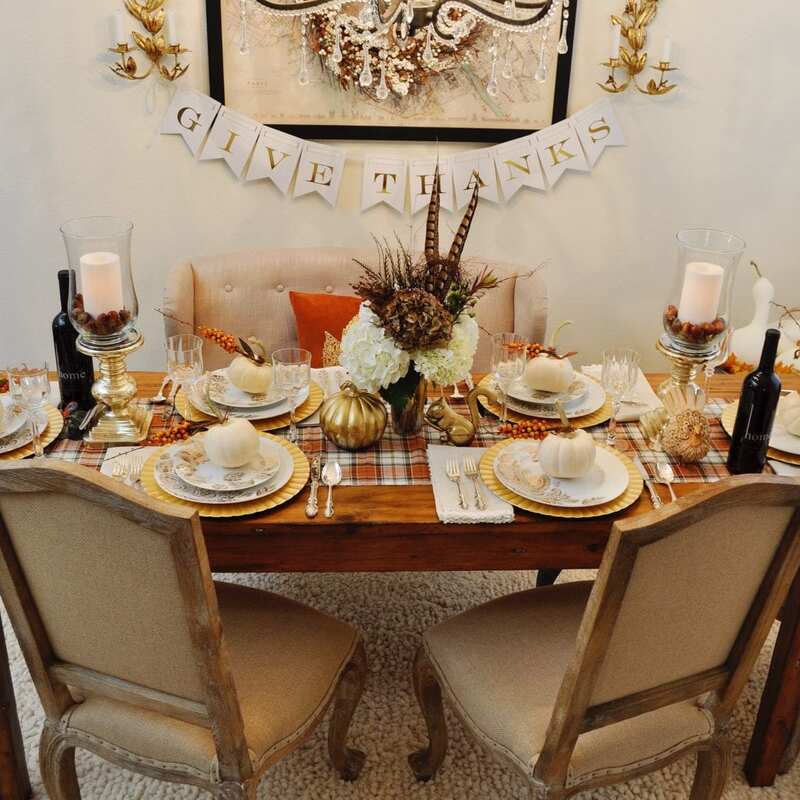 Please visit these 4 other talented friends of mine to see their gorgeous Thanksgiving Tables! 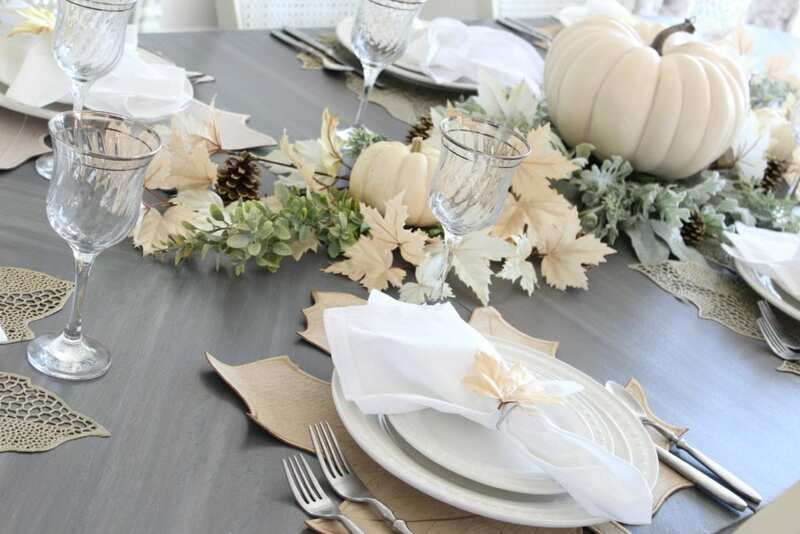 Don’t forget to pin what you love so that you have it when putting your table together! I’d love for you to follow me on Instagram and even subscribe to my newsletter (top of the page) for weekly posts and sale alerts to my online shoppe! See you soon! Your table is stunning, Summer! And I would never have guessed that those beautiful leafy placemats are plastic! You and your spray paint have worked magic again! Love all your pretty details – well done, my friend! 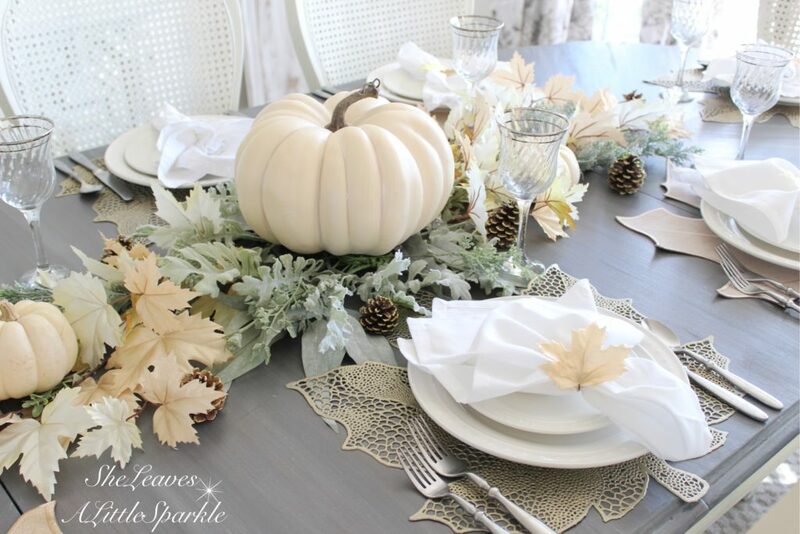 Summer this Thanksgiving table is gorgeous!!! Love the shimmering leaves, so soft and elegant. I like how you solved your place mat dilemma. Absolutely stunning; spot on beautiful!!!! Beautifully done, Summer! You explain it so well and make it look easy, but yet so elegant. 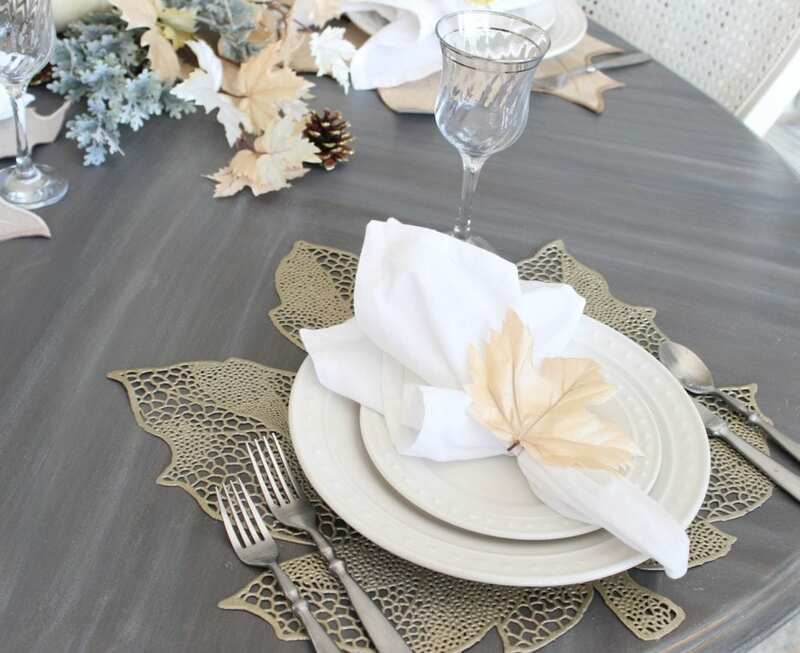 Love the use of 2 different placemats and yes, you do love your spray paint and always do such a great job with it. You are amazing and I loved to be a part of this with you! You are always so sweet, Alicia… Thank you friend! I wish we lived closer and could throw some kind of dinner party together because I know we both love to create table scapes! Have a great weekend! Oh wow, Summer! Every post you have is gorgeous, but this one is so stunning!! 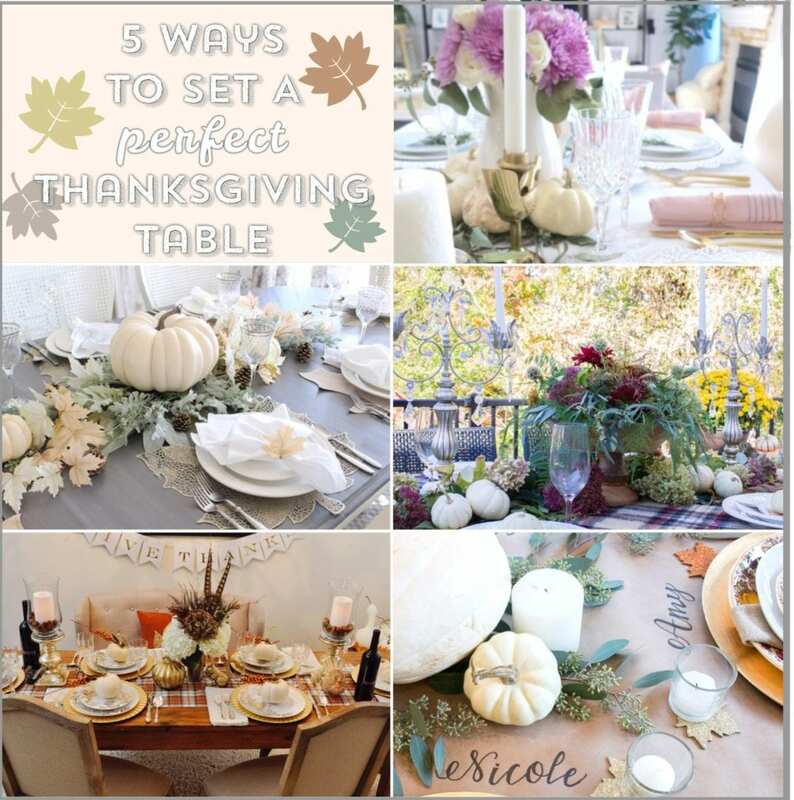 I love tablescape posts so this was so much fun to read and look at all your beautiful photos!! I love the placemats from Homegoods!